It’s just a man and his guitar. And stories. And the occasional poem or a capella piece. Not chasing fame or fortune, mind you. Just trying to get a message across in his fight for a better world with affordable health care for all. 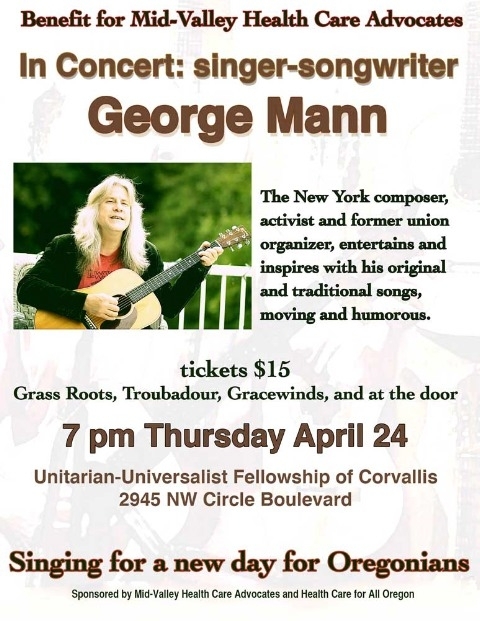 Mann, a former union organizer and activist, is doing a series of benefit concerts throughout Oregon, with other stops in Bend, Phoenix, Florence, Eugene, Corvallis and Portland. Mann sings songs from the last century of labor and social activism as well as his own songs, powerful and funny takes on the state of the nation. Full Article.